Location: 12th. St. @ J St. Comments: Evergreen conifer native to California. 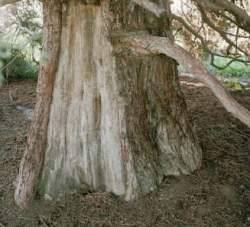 Trees are a grey-green with short cedar like needles and thick red bark. Locally, these trees can be 100' tall with a 25' spread. Giant Sequoias are the largest trees in the world and are some of the oldest at over 3,300 years. 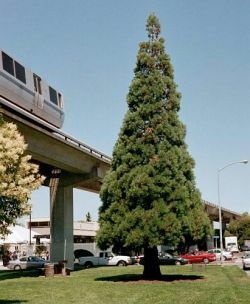 Specimen is located along the BART tracks.